Miyazaki Beef is 100% purebred Japanese Wagyu from the Miyachiku co-op. The name of the breed of cow that is used by Miyachiku is Kuroge Washu, also known as "Japanese Black". 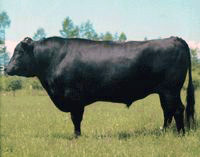 It is one of four Wagyu breeds that exist today, Kuroge being the largest of the four cattle breeds. It was not until September of 2012 that Japanese Wagyu was permitted in the states. The Miyachiku co-op is located in the Miyazaki Prefecture of Japan. A Japanese Prefecture is similar to a state or province. The Miyazaki Prefecture is the 2nd largest producer of Japanese Black cattle, and only the highest quality cattle from this region can be dubbed "Miyazakigyu". In 2007, this class of cow boasted the "Champion Cow" of the "Wagyu Olympics," and the fame is gradually gaining momentum. It’s beautiful color is one of its attractive factors. In official sumo, it is custom to present the champion sumo wrestler with one Miyazaki cow. Miyazaki prefecture is the only region in Japan that raises cattle by their breeds and biological types. For the past 10 years, Miyazaki has produced the highest quality beef in Japan, even higher than Kobe. Miyazaki Wagyu is not Kobe. Kobe beef is a Tajima strain of Wagyu Cattle and produced in the Hyogo Prefecture. The Miyachiku co-op consists of about 400 farmers spread across the Miyazaki Prefecture. The Japanese farms are much different than farms that we are used to in the fact that the average amount of cattle that one farmer will harvest at a time is 4. This allows the farmers to pay attention to detail, take much better care of their animals, and focus on each individual animal's needs. The animals are fed a diet mostly of wheat and corn for an average of 900 days. This is about 8 times longer than most cattle that is consumed in our market. Each individual farmer has their own proprietary feed ratio. The idea of Wagyu being fed beer and massaged by Japanese women is a myth, however the farmers are allowed to feed their animals whatever they deem appropriate. Maybe there is a farm or two out there that practices this technique! In a bid to maintain the high standard of the Miyazaki Wagyu, the Japanese authority have restricted the supplies of the prestigious beef to authorized distributors. In Japan, restaurants that are allowed to offer Miyazaki Wagyu on their menus are requested to put up an authorization notice in their store. They also need set up a designated counter to display the meat. To be an authorized distributor is even more rigorous. As you can imagine, we are very proud to be carrying A5 Miyachiku Wagyu here at Rare Edibles. The standards of grading beef consist of Yield Grade and Quality Grade. "A" of "A5" means the yield grade, while "5" shows the quality grade. Moreover, the Japanese beef grading system has 5 quality grades; marbling, meat color and brightness, firmness and texture of meat, color, and the luster and quality of fat. Miyazaki Wagyu is recognized for its cherry red colour, tender texture and great dense meat taste. The snowflake-liked fat is evenly distributed and produces a non-greasy flavour. It begins to dissolve at the temperature of 25 degrees Celsius, melting right in the mouth. At Rare Edibles, we carry only the finest, that is A5 Miyachiku Wagyu straight from Miyazaki. Miyazaki Wagyu have won various awards from the industry, including the most honoured "National Wagyu Award" by the Wagyu Registry Association in Japan. The award, also known as the "Wagyu's Academy Award", is given to the best cattle once every five years. Each time, more than 400 wagyu from some 30 places of origin would compete in the event which is attended by imperial family members. The beef are judged by their colour, fat distribution, meat fibres and taste. The National Wagyu Award has now gone to Miyazaki Wagyu two consecutive times meaning it has held the reigns for ten years! With its outstanding meat quality and breeding ability, the Miyazaki Wagyu won the "Prime Minister Award" in 2007. They also beat the beef from Kobe and Matsuzaka and became the overall winner - winning seven out of the nine contests - at the event. Miyazaki Wagyu has been called "Japan's Number One Beef" ever since.